For people who turn to exercise to maintain their health, work off stress or just have a ton of fun, being sidelined by a sports-related injury can be incredibly frustrating. Your first instinct may be to dial up a foot doctor in Belleville, IL and book a same-day appointment, but the following at-home treatments for sports-related injuries may be just what you need to get back on your feet and back in action! 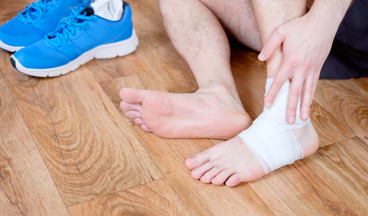 One of the first things you’ll want to do following a sports-related injury is to immobilize the injured area. Use an elastic bandage or splint to keep the injured area supported and secure but keep an eye on the compression; any signs of tingling, numbness, or additional swelling may mean you need to loosen the wrap. Avoid putting ice directly on the skin. Instead, place ice in a bag and then wrap the bag (or an ice pack) in a towel. Apply the ice for no more than 15 minutes at a time. Once your skin returns to its normal temperature, you can start icing it again. Listen to your body. If your skin feels too cold, it probably is. Whenever possible, make sure the injured area stays elevated. Stacking some pillows on your bed or tucking a couch cushion under an injured ankle or foot will help reduce blood flow to the injury and allow it the time and space it needs to kick-start the healing process. Above all, give your body time to rest! It’s hard to sit out during the playoffs or to take time off from your regular gym routine, but a small sacrifice now could lead to a much more satisfying recovery down the road. Hopefully these at-home treatments are all you need to heal up, but some sports-related injuries require a visit to a Belleville, IL foot doctor. Call 618.277.9533 to schedule an appointment at our podiatry office in Belleville, IL and we’ll do everything we can to get you back in the game!